Organic food is big business. According to the Organic Trade Association, U.S. sales of organic food and beverages went from $1 billion in 1990 to $26.7 billion in 2010. The Organic Monitor estimates that organic sales (globally) reached $54.9 billion in 2009. But, unfortunately, many small organic farms are selling out to bigger food corporations. We must ask - who can we trust? On the next NaturalNews Talk Hour - Jonathan Landsman and Mark Kastel, one of the leading advocates for organic food integrity will talk about the current trends within the organic food industry; the legal aspects of organic branding; the GMO labeling movement plus much more. If you care about the source of your food supply - don't miss this show! 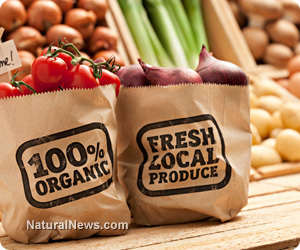 'Organic' food from China - can we believe it? Whole Foods, arguably the largest retailer of organic foods, ended the year 2013 with sales approaching $13 billion. Clearly, consumer demand for fresh, organic (healthy) food is on the rise. But, wait, for the uninformed consumer - you may want to be careful with your food money. Many of the foods sold at Whole foods - plus many other health food stores - are loaded with heavy metals, genetically modified ingredients and may not be organic, especially if these foods come from China. You see, even though we see the 'USDA organic seal' - many of these foods from China are not really inspected by USDA officials. We have to trust or rely on a 'third party' inspector that resides inside China. In addition, we have to wonder about the quality of the food grown in China - due to its contaminated water supply. A growing number of health conscious consumers are learning that polluted water will usually equal a greater risk for heavy metal toxicity. Bottom line - just because a food product says it's 'organic' doesn't mean it's safe to eat. Know your source. On the next NaturalNews Talk Hour, Jonathan Landsman and Mark Kastel, a leading organic food advocate will talk about the integrity of the entire organic food market plus much more. Obvious, for most people, it's a bit challenging to buy every food item locally. So, at the very least really get to know the source of your food - before you make your purchase. No one wants to invest in toxic food - which promotes sickness and disease. Naturally, there's nothing more enjoyable (or healthier) than buying food from a local, organic farmers market. Even better - try to grow your own food. You can even create a sprout garden - indoors! 1. Local food taste better. Obviously, when food is grown locally, you've got a better chance of eating fresher food. Most produce, in the supermarket, is picked weeks ahead of time - before it's ripe. 2. Eating local food is seasonal. This is one of the best ways to get 'in touch' with nature. As you eat food seasonally - you'll also notice that your diet tends to have much more variety. 3. Local food has more nutrition. Once a fruit or vegetable is picked - it will begin to lose its nutritional value. When you buy local food - you're more likely to be eating fresher food - filled with more vitamins and minerals. 4. Local food supports your community. This is a great way to boost the economy around you. When you spend your money (locally) - it helps to support local farmers. This money is more likely to be re-invested in local businesses and services. 5. Local food is better for the environment. This is a great reason to buy locally-grown, organic food. Many of these farmers are less likely to use an abundance of dangerous chemicals or use genetically modified seeds to grow their crops. Want to help defeat Monsanto? Buy local, organic food. Mark Kastel is co-founder of The Cornucopia Institute, a populist farm policy research group and directs the 'Organic Integrity Project'. For almost 20 years, his professional practice included political consulting, lobbying on behalf of family farm groups, and business development work benefiting family-scale farmers. Mark has played a key role in a number of cooperative ventures designed to empower farmers in the marketplace. His development work has focused on creating sustainable farmer-owned businesses with an emphasis on dairy production and marketing. Do you know what you're buying? One of the most important aspects of a healthy lifestyle is to know the source of your food. Today, we see big companies buying up small, local organic food providers. On the next NaturalNews Talk Hour - we'll talk about organic brands; farmers markets; GMOs; USDA policy plus much more. Join us and learn more about the quality of our food supply.